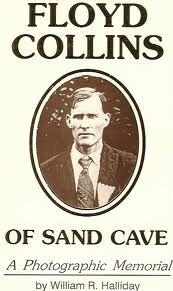 His name was Floyd Collins. He was a legendary spelunker, a cave explorer that is, and more generally a backwoods, homegrown son of the state of Kentucky. Back in the 1920s, it was Floyd who put Mammoth Cave, Kentucky on the map. It’s not that Collins discovered the cave system. It’s one of the largest and best known in the world, utilized by the people of the Americas for centuries. But this entrepreneur succeeded in turning it into a tourist and commercial enterprise. Floyd, however, was not one to sit on his laurels. Always hungry for new exploration and the next big discovery, on January 30, 1925, he crawled into a dark, wet, rat hole known as SandCave. It would be Floyd’s last such adventure. Collins slithered his way nearly two hundred feet underground with nothing but a kerosene lamp and a glass bottle of black coffee. Some passages he shoved himself through were no more than inches wide. In one such narrow place, a small rock – no bigger than a kitchen toaster – dislodged from the wall and wedged against Collins’ foot. And try as he might, he could not free his ankle from this trap. Relatives eventually took notice of old Floyd’s absence. They arrived at his latest hangout and confirmed the worst: Floyd Collins, America’s Greatest Cave Explorer, was caught, literally, between a rock and a hard place. A massive rescue effort began, capturing the nation’s attention in the century’s first genuine media frenzy. More than 50,000 spectators arrived at the scene, some to assist, most to observe, and some only because the food and drink were flowing. Carnivals were set up with sideshows, hot dogs, balloons, and medicine men. There were jugglers, performers, street preachers, vendors and reporters, all capitalizing on the situation. This partying circus up above lasted for nearly three weeks. It grew so electrifying and self-absorbed, that down below, poor Floyd Collins was largely forgotten. The very reason for all the commotion – the very one who started the party – became a footnote in history. When I read Collin’s story I couldn’t help but think of the resurrection. Tomorrow, the annual party begins once again. Many of us will dust off our Easter best, and dressed to the nines, we will go out to watch the show on the cathedral stage. It will be the best music of the year. The preacher and other performers will have worked very hard on their soliloquies, memorizing their lines. There will be pageantry, ceremony, and spectacle; even a few medicine men capitalizing on the situation I suppose. We will enjoy ourselves. We will be entertained, maybe even moved. We will quickly follow the show with a good meal, a few mimosas or sweet wine, and then watch the kids find some eggs out in the back yard. And come Monday, we will return to our routines, largely forgetting the One for whom this party is celebrated. As Christians we do not believe that our Lord is trapped in a hole in the ground. We believe that Jesus was crucified, dead, and buried; but on the third day he rose again. And we believe his resurrection is the deposit paid on our own rebirth. Because he lives, we who are in Christ, will live as well. This is ample reason for one magnificent party. So yes, let’s don our finest clothes. Let’s tune our instruments and memorize our lines. Hide the eggs, raise a glass, shout “Hallelujah!” from the rooftops, and let the pomp and circumstance that is the Easter celebration of resurrection begin. But please, let’s not ignore who this party is for, and who called us together in the first place. Come Monday, let’s not forget why we gathered in our houses of worship bright and early on the Lord’s Day. For while this celebration may involve everything from bonnets and big tops to whirling dervishes and baked ham, it is truly about the One who crawled into a hole called death, to defeat it. And defeat it He did. Let the party begin.